The Springs Parker Manor in Weatherford, Texas is beautiful in the fall! A little bit if backstory from the bride: Preston and I met at my dad’s gas station in 2015. I worked there as a cashier when I was home for holidays and Preston would come in every single day to grab coffee, energy drinks, gas, etc. I knew from the moment I saw him that he was the one and we’ve been inseparable ever since. Q: What was your favorite memory from the big day? 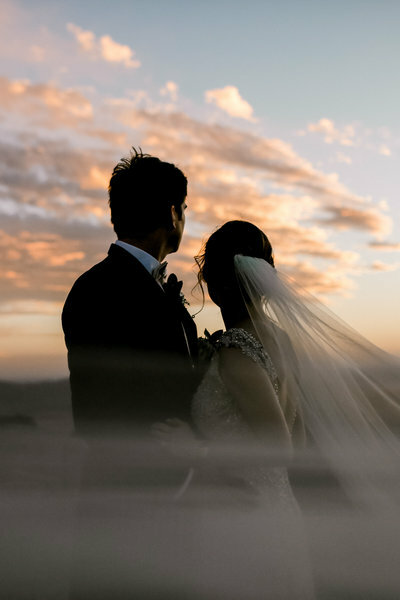 A: My favorite memory of the day was our first-look. I loved getting to take the moment in with just Preston. I will forever be grateful for those moments. My next favorite moment was getting to party our pants off with all our family and guests! 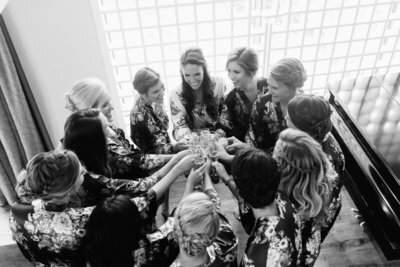 The bridesmaid’s dresses: For bridesmaid dresses, I chose navy Show Me Your Mumu dresses. I loved that each of my bridesmaids were able to choose which style best fit their personality and body types. I wanted everyone to be comfy, but still stylish. Q: What was your style vision and color palette? A: Navy with bright colors, accented with rose gold, as well as burgundy to bring in a touch of fall. 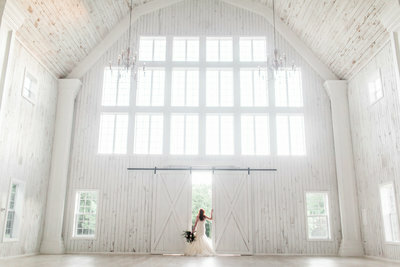 A: For my gown, I knew I wanted a lace dress with lots of detail to add some southern flare to match the venue’s vibe. Advice from the bride: Try and make the planning process as enjoyable and fun as possible. If you are feeling stressed, I highly recommend getting a wedding planner! We were worry free the month leading up to the wedding and the day of (shout-out to Designed 2 Perfection). Lastly, HIRE EMILY WATKINS – She was such a joy to be around and made Preston and I feel so comfortable in front of the camera (which is not an easy task haha). Emily effortlessly captured all the important moments on our big day and I am absolutely blown away by her work. 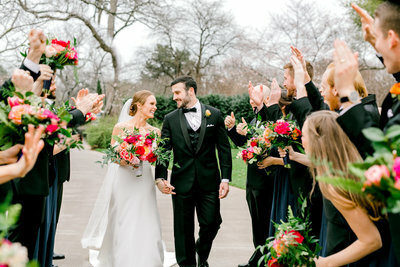 The flowers described by the brides: I had Bold-colored flowers (mainly roses and ranunculus) with greenery, berries, and thistles to add texture.